You can design your brain to create a good life for yourself. No matter how long your life turns out to be, you probably want it to be a good life, a life worth living. But, just what is a good life? What conditions would need to be present for you to consider your life “a good life?” And, once you know what your good life is, how do you go about getting it? Blueprints for a Better Brain will help you define your good life and outline a systematic, science-based approach to help you achieve it. 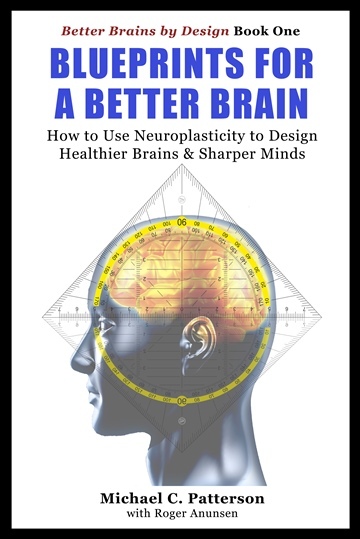 Blueprints for a Better Brain, book one in the Better Brains by Design series, explains how smart behavioral choices can create plastic changes in our brain that promote health and cultivate habits of happiness and wellbeing. It explains how you can achieve a good life (wellbeing) by designing your brain to flourish across multiple domains. Recent revelations from the fields of neuroscience make it clear that our brains are incredibly plastic, or malleable, throughout our lives. Our brain cells wither and die if they are neglected and under-used. But they come to life when they are challenged and wire together into modules and networks that support the actions and thoughts that we practice and rehearse. This incredible plasticity gives us the opportunity to consciously and deliberately shape the very architecture of our brains by making wise choices about what we do, think, feel and experience. Blueprints for a Better Brain gives you the big picture about building better brains. It reviews the foundations and infrastructure of the Better Brains by Design, providing you with a set of blueprints that will guide the design of your better brain. You will learn to avoid behaviors and habits that put your brain at risk and foster negative thinking and feeling. You will learn to replace bad habits with good ones. You will nurture and cultivate healthy and positive habits that make your brain better and stronger, habits that help you develop the brainpower you need to promote pleasure and purpose in your life. BBBD #5, “The Science of Better Brains,” (April 2016, pre-order now. Michael C. Patterson is an author, scholar and program developer who has been instrumental in growing the fields of creative aging and brain health. Michael developed and directed AARP’s award-winning Staying Sharp brain health program and was a founding board member of the National Center for Creative Aging (NCCA). In 2009, Michael and Roger Anunsen co-founded MINDRAMP CONSULTING, a company that has pioneered the translation of current research into practical, behavior-based programs that promote brain health and flourishing. Michael is a frequent speaker, facilitator and blogger on the topics of brain health, creativity and the arts. His most recent books include the five-part series Better Brains by Design, and the text books Strong Brains, Sharp Minds, and Creative Activity Design. Michael has had numerous careers, including acting and directing in the theatre and project development for PBS, the Public Broadcasting Service.